This year, Sunday, December 8, 2013, the Green Thumb Garden Club features homes in Johnston, S.C., on Highway 23, for their yearly Christmas Tour of Homes. These sites can be all found on Calhoun Street. Tickets are $10.00 and can be purchased at all homes. Spiced tea and cake will be served at Dry Creek Baptist Church, Ward, S.C., one of the places open for touring. This is the home of Jerry and Robin Hagaman. It is located on the eastern edge of Johnston and is the centerpiece of the Carriage Run Farm Equestrian Facility. 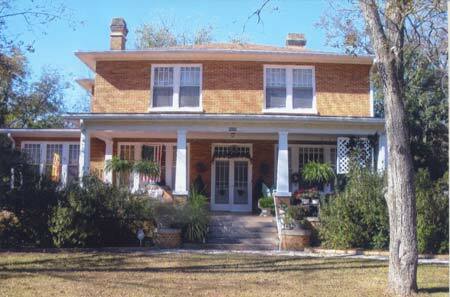 The house was built in 1906 by the carpenter Robert Price, thought to have come from the Orangeburg area. Earlier Mr. Price built the Witt-Derrick House, in 1885, at 1195 Calhoun. He left Johnston and returned to build the Feagle House, next door to the Witt-Derrick House. The Feagle house features both Greek Revival and Neo-Classical styles. The floor plan is a larger version of the Witt-Derrick house. 1045 Calhoun Street is the home of Chris and Linda Clancy, and is a Colonial Revival style home. It has been owned by the Clancys since 2000. Called “shotgun house,” one can see all the way through the house from the street to the woods in the back yard. Built in 1905 by Tony Turner, a local builder and architect, it was built for the Hezekiah and Watson family. Henry Wofford later purchased the house and turned it into two rental apartments. Over the years it fell into neglect and in 1971 Anne and Clyde Smith bought it for $3,500. They restored it to its original condition except for plumbing and electrical. Over the years there have been changes, with many improvements since the Clancys purchased it. Frank and Barbara Darracott own the two-story beige brick house just outside the eastern town limits of Johnston, 1036 Calhoun St. It was built by William Marion Sawyer in 1918. The oversized bricks were products of Merry Brothers Brick Co. in Augusta and shipped by rail to the Johnston Depot, then transported to the site packed in straw, by mule-drawn wagons. Called Ridge Grove, it was a working farm and several of the original buildings are still in use. Ridge Grove was purchased in 1997 by Frank and Barbara Darracott. They resided in the Greenville-Anderson area prior to returning to Johnston. It is considered to be American Foursquare or Prairie Box Style. The structure is a two-story via a hipped roof. A sun porch is on the Johnston side along with an enclosed porch on the back of the house. Kurt and Judy Sutton live at 136 Calhoun Street, the address of the Avory Bland house. Avory Bland II was the first mayor of Johnston from 1875-1889 and he built the house. He married Ella Wright and the Blands and Wrights were landholding families. Bland cemeteries can be found on Bland Baptist Rd. Avory Bland was born in the house which is dated 1884/1885. The style of the house is Italianate Victorian. It is possible that Austrian born architect Michael Anton Markert (1831-1895), who lived in Edgefield, designed the house. Judy and Kurt purchased the house in February 2006 and could not move in right away due to fire damage. The home has been completely renovated to the colonial/early country style and gardens have been added to the property. The owners are dismantling an old log cabin and are reconstructing it on their property. Dry Creek Baptist Church, located by Dry Creek in Saluda County near Ward, was formed almost entirely from the church at Cloud’s Creek situated near Ridge Spring. It was weather-boarded over with plank and stood 600 years from the present church. Later a log house was built with a shed room behind it for the slaves. The membership increased and the log cabin church was done away with and a small weather-boarded house was built with a shed room for the slaves. The present building was dedicated on July 13, 1845. The first church had no indoor baptistery and an outdoor pool was used, with water furnished by a nearby spring. A parsonage was built in 1888 at a cost of $1200.00 and later sold. The church’s largest single project was the erection of the fellowship building, dedicated and named for Rev. Lowell L. Clark who served as pastor for 41 years. The Ridge Spring Methodist Episcopal Church is at 206 DuBose Street in Ridge Spring, It was built in 1882 and valued at $1500. It was a handsome wooden structure; Caleb Watkins built this early church. In 1899 a big room was added and a wooden steeple was built. In 1976 the ladies of the church made Chrismons ornaments that are used today. The present pastor is Rev. John Kneece from Leesville. This year the members cleaned and prepared the church parsonage for a recreation center and they named it the Joe and Betty Watson Family Life Center. In Ward on 150 Church Street stands the Spann Church, unique among nineteenth century churches for surviving almost unchanged for 134 years. The original building, probably constructed of logs, has not survived. In 1873 the congregation built the present sanctuary and sold the old one to Mount Alpha Baptist Church. The building and the furnishings remain unchanged. Recently the church has added restroom facilities a short distance behind the sanctuary.